Hans Ledwinka – the inventor of the world-renowned Tatra concept – was born 140 years ago. He was responsible for numerous patents and model designs, and today's TATRA vehicles are still based on his pioneering chassis concept. In the early years of motoring, a number of Central European car designers and engineers – originally working independently of each other – joined forces to make a major contribution to the development of automotive technology. Hans Ledwinka was responsible for almost all the ground-breaking technical solutions pioneered by TATRA, the oldest Czech automotive producer (and today the only Czech-owned producer of motor vehicles), during the first half of the 20th century. Ledwinka was born on 14 February 1878 in the Austrian town of Klosterneuburg. He was proud of his Austrian nationality. He was a German-speaker, and he never managed to learn any Czech; instead he expected everybody to speak German to him. However, he was always willing to recognize excellent work from members of his team – whatever their nationality. After completing his studies at an industrial school in 1896, Ledwinka found a job working for a company in Kopřivnice (Nesselsdorf). The Nesselsdorfer Wagenbau-Fabriks Gesellschaft made horse-drawn carriages, railway wagons, and various types of seat covers and similar products. Ledwinka began his career in the railway wagon division. In the following year the company set up a small division making motor vehicles. The head of the new division was the 24-year-old Viennese engineer Edmund Rumpler, who appointed the 18-year-old Ledwinka as his assistant. In 1902 Ledwinka left the company following a disagreement with the workshop manager Leopold Sviták. He was recruited by a Viennese company run by Alexander Friedmann, where – working alongside Professor Knoller – he built steam engines. Three years later, he left steam technology behind and returned to his former employer in Kopřivnice – this time at the request of the company's director Hugo Fischer von Rösslerstamm – to develop internal combustion engines. Ledwinka's first task was to improve the design of the company's engines and gearboxes. He created the four-cylinder S-type engine with slanted valves and screwed-in valve seats. The engine had a tunnel crankcase with circular openings on the left side providing easy access to the connecting rod bearings. The new gearbox was also a pioneering work of engineering; its bell-shaped structure meant that it only needed five cogwheels. 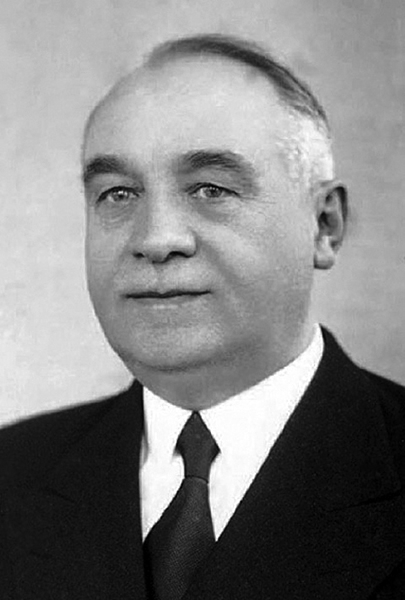 Ledwinka was now the head of the company's automotive production division, but he continued to be involved in conflicts with his colleagues – particularly the director Erhard Kölbel. After a major disagreement with Kölbel, who wanted to invest a state subsidy in the railway wagon division, Ledwinka again left the company (in 1916) to work for one of its major competitors – the Steyr-Werke in Graz. Ledwinka's second departure from Kopřivnice was to have major repercussions. 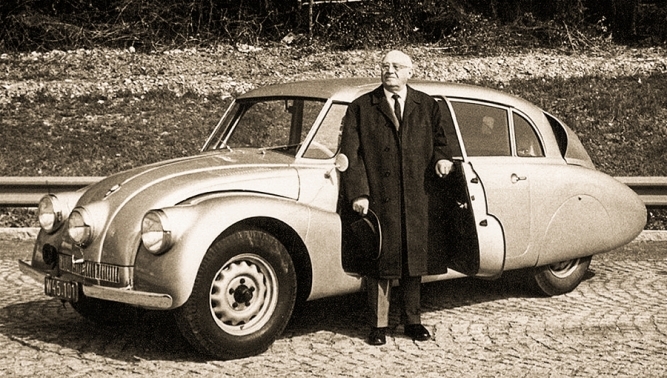 It was during this period that he became closely acquainted with Ferdinand Porsche, an engineer from North Bohemia, whose later designs for VW showed marked similarities with Ledwinka's ideas, eventually leading to a dispute over alleged patent infringements. However, in 1921 Ledwinka returned to his former employer in Kopřivnice once more, when the director Leopold Pasching recruited him to run the company's newly built car plant (a project that was the brainchild of the engineer Max Reschl). Two years later, Ledwinka's efforts were rewarded when production of the TATRA 11 was launched. The car represented a completely original design solution: its chassis was based on a central backbone tube with a two-cylinder air-cooled engine and a gearbox at the front, and a rear suspension unit featuring independently suspended swinging half-axles. A patent application for the swinging half-axle system had already been filed in 1903 by Edmund Rumpler, who at the time was working for the Adler Werke in Frankfurt. The suspension setup was thus not originally Ledwinka's idea, but the chassis concept was entirely his own – and it remains his greatest contribution to engineering design. Ledwinka's TATRA chassis concept was later used in the production of goods vehicles – starting with the T 23 and T 24 (1926). It has been used in TATRA goods vehicles since then, and it continues to be used today. The 1930s ushered in a new era for car design at TATRA. Headed by Ledwinka and featuring the German designer Erich Übelacker and Ledwinka's son Erich, the company's design team developed cars with strikingly aerodynamic bodywork. In June 1945, after Czechoslovakia's liberation from the Nazi occupation, Hans Ledwinka – now the deputy director at the Ringhoffer-Tatra company – was arrested and convicted by a people's court for his contribution to the German war effort. In 1948 he was convicted of having been a collaborator and sentenced to six years' imprisonment, after which he was to be expelled from the country. Ledwinka and his son Erich had already been investigated by the Czechoslovak police between the two world wars. In the 1950s, Hans Ledwinka left Czechoslovakia to settle in his native Austria, and later moved to West Germany. He died in Munich on 2 March 1967. In his later years, he appeared as a witness in a legal dispute between the Ringhoffer family (the former owners of TATRA) and Volkswagen over alleged patent infringements; he helped to broker an out-of-court settlement. However, Ledwinka himself did not benefit financially from the settlement, as he could not afford adequate legal representation. On 14 February 1992, Hans Ledwinka was officially rehabilitated by Czechoslovakia's Supreme Court – 44 years after his conviction for collaboration.